We know that the excessive unprotected sun exposure causes severe damage to the skin and we encourage people of darker skin tones to follow medical advice by taking adequate precautions against sun damage. However, do you know how the sun actually damages the skin? We believe that if you know how this damage occurs, then you are more like to heed the call for sun protection. These make up the longest wave lengths and account for some 95% of the UV radiation that reaches the earth. These rays are pretty much at the same strength throughout the year, regardless of season and they penetrate can through cloud and glass. UVA rays penetrate deeper and further into the dermis (the second layer of skin) and are responsible for premature ageing and wrinkling of the skin. This is a compounded effect over time as collagen and elastin is gradually degraded eventually causing saggy skin. This information has been around for years, but every year there is more detailed research that reveals just how potent UVA rays really are. Research over the last twenty-five years indicates that UVA rays contribute and possibly initiate cancer in the basal and squamous cells which sit in the epidermis (top most layer of skin). Research also shows that the closer you get to the Earth’s poles, the higher the level of UVA rays, which means that people of colour living in Northern European countries like Britain really do need protection against these powerful rays, more so than people living in sub Saharan Africa for example, who conversely have a higher requirement for UVB protection instead. They are chiefly responsible for burning the skin. Their reach is limited to the epidermis, where they cause the most damage to skin cells leading to the development of skin cancer like Melanoma. Whilst there may not be any obvious reddening of the skin, black skin can feel tender, sore or irritated as a result. UVB rays damage the skin all year round, but their intensity varies time of day, geographical location and the season. Unfortunately, when you’re at high altitudes or in snowy/icy conditions, UVA rays can bounce back unto the skin consequently penetrating the skin twice and intensifying the damage. 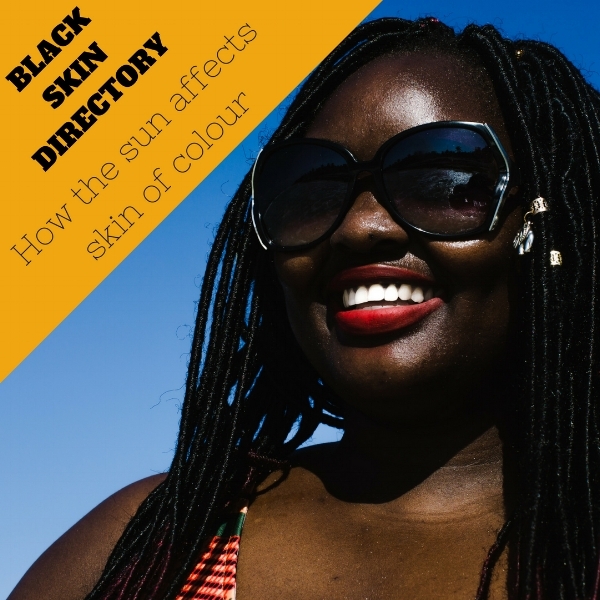 Both UVA and UVB rays contribute towards hyperpigmentation and other discolourations of the skin, which is why darker skin tones are encouraged to take precautions against the sun. Failure to do this results in a patchy and mottled appearance of dark skin; one of the first indications of ageing in people of colour as opposed to Caucasian skin that reveals lines and wrinkles instead. It’s important to remember that when your skin goes darker in the sun, it’s the pigmentation cells producing more melanin to protect the skin from damage. The darkening of the skin is a protective measure and not a mark of health or beauty as is often thought. There is one more ray - UVC rays which are absorbed by the ozone layer and do not reach the earth. Thankfully, one less ray for us all to worry about! Do look out for our next article, looking at different types of sunscreen protection suited to darker skin tones.